92 percent of small-to-medium sized business with an inventory make the effort to track it. In other words, almost every business is making sure that they know where their inventory is. Many SMBs still fail every year though, which means it’s not enough to track. You have to track your inventory well. And if you don’t, your business may see some serious consequences. The way you track may decide if you stay in business or not. But knowing how to track well can be a difficult task to start, especially if you never have before. Lucky for you, we’re experts on this topic. In this article, we’ve combined the best inventory management techniques. Take our advice, and soon you’ll be managing your inventory like a pro. Read on for 9 inventory management tips. Inventory management is a crucial aspect of any business function. Without it, you may be unable to run your business well. Inventory management makes sure that your product doesn’t spoil. When working with food or other perishable items, you have to make sure you keep an eye on your products. Otherwise, you may waste money. It also makes sure that you don’t buy products that you won’t be able to sell later. These items that haven’t perished is what we call dead stock. For example, imagine there is a new trend to buy a certain type of shirt for the fall. If you buy 300 of them but only sell 200, you have 100 items of dead stock. And you might not be able to sell the rest of those shirts. This can become quite frustrating for business owners with this issue. You can also reduce the amount of stock you have with effective management. This will clean up room for other items that you need later. FIFO stands for “first in, first out” and is a common saying in inventory management. This means that you should always sell your oldest items first. This has many benefits for you as the seller. This makes sure that you don’t create any spoilage with old products. It also means that you have an easier time tracking how much you need to buy of each product. When taking out the product, you’ll be able to see how long it sat on your shelf since you bought it. For consumers, this means they always get products that are in good condition. While they may not be the newest, they’ll still have ones that haven’t gone wrong. You should also make an effort to set the standard amount of each stock you need at a time. Doing this will ensure that you never run out of the items you need. Deciding how much you need on a regular basis may be difficult to figure out. And it will take a few weeks or months to decide. After some time, find an average for how many sales you made of one each item. Then, inflate the average a bit for some cushion. This should be your standard. Having your standard stock number helps you budget for your business better. For most months, you always know how much you’ll spend on inventory. You should keep in mind that you’ll need to buy more of certain stock depending on the month. For example, you might need to buy more candy around Halloween. A set standard also means you can delegate inventory buying to an employee. Except for special circumstances, they can do the work for you. As a business owner, you know that problems almost always will occur. And the same goes for your inventory. Preparing for inventory problems now will save you in the future. One common problem is overbuying or underselling a product. Unless it’s perishable, you might be able to save it to sell in the future. You may also have warehouse issues and need more room. We’ll discuss more about this in the next point, but you should be ready to purge some of your product. With inventory, you need to have some wiggle room. While any loss is bad, you might have some in the future. Know that your gains will help even this out. To make sure that you are moving the stock in an efficient manner, you should redesign your warehouse. This can take some time, but it will be worth it. Move the items you sell most often to the front of your warehouse. Your employees will have an easier time finding what they often need. After that, move the rest of the items from most used to least used. This is not the only system that works though. Instead, you could create a barcode system to make finding items even easier. Like a library, employees would have to do no more than search for their item. You could combine these two options to make the most efficient warehouse possible. Do this by correlating the barcodes with how often you use the item. Consider using technology to make sure you know what’s going on in your inventory. While pen and paper may work well, technology has some other perks. Use a cloud-based system for managing your inventory. This allows all your employees to see what items you have in there at the same time. A cloud-based system also allows authorized users to change and add information. With it, your employees will be able to make changes as soon as they know. This helps make sure your organization doesn’t lag behind on paper. With this, you won’t even have to leave your desk to check your inventory. Looking for More Inventory Management Techniques? 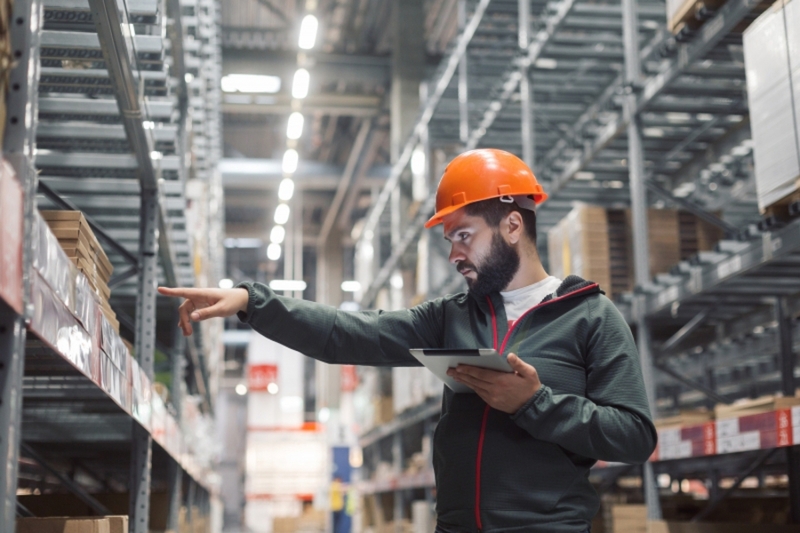 With these inventory management techniques, you should be ready to help your business. Soon you’ll see a more organized and effective warehouse. Did you like this article? Read more on our barcode and labels blog. For more about what we do, check out our services page. And if you have any questions, feel free to contact us.